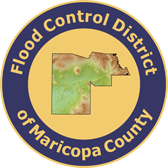 Report a Flood was created by Flood Control District of Maricopa County to enable residents to view and share images and videos of current and past flooding incidents. The information submitted will be used by the Flood Control District of Maricopa County to better protect residents from flooding. You will not receive a personal response when you upload a photo or video. If you wish to speak with someone about flooding issues in Maricopa County, contact the Flood Control District of Maricopa County at (602) 506-2419. By clicking Launch, you indicate that you agree to the disclaimer and terms and conditions. By submitting photograph or videos, you are providing consent to the Flood Control District of Maricopa County to display your submitted photographs or videos in public, including but not limited to public displays, this website and the main Flood Control District of Maricopa County website. Please review the full disclaimer and terms and conditions on the about page.